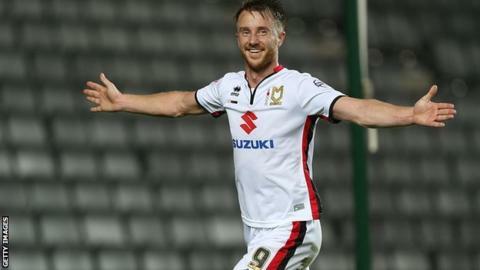 A first-half goal from Dean Bowditch gave MK Dons victory over managerless strugglers Charlton Athletic. The Addicks nearly took an early lead but Dons goalkeeper David Martin saved brilliantly from Jordan Cousins. Bowditch put the hosts ahead with their first goal in more than five hours with a neat finish after linking up well with Samir Carruthers. Nicky Maynard was twice denied by away keeper Stephen Henderson and Bowditch hit the post as the Dons dominated. The three points were a welcome boost for Karl Robinson's men, who are now four points clear of the bottom three in the Championship. In contrast, the Addicks remain second from bottom and have failed to score since 4 October, losing their last five matches. After Cousins had gone close to ending that search for a goal, the home team got on top and Henderson had to scramble away a Matt Upson effort before Bowditch scored his second goal of the season. Maynard, without a goal since August 2014, should have put the home side 2-0 up but lacked conviction when played through on goal and Henderson then denied him for a second time when he saved his curling effort. Bowditch hit a post with a powerful shot from a tight angle before Charlton defender Patrick Bauer had a late header blocked. "I thought we were outstanding. It's just a bit disappointing as we should have had a convincing victory. "The boys have done well to create as many chances as they did and we need to take them. "There was a little bit of nervous energy around the place, but it takes us four points clear of the drop zone, which is a nice cushion to have." "I'm concerned with the lack of chances we created, but the Dons only created their chances after we took a lot of risks and we gave them a lot of space. "We need to get a win as soon as possible to turn this bad run around. "It's not about me, my concern is the team and I think there are other concerns at this moment." Match ends, MK Dons 1, Charlton Athletic 0. Second Half ends, MK Dons 1, Charlton Athletic 0. Offside, MK Dons. Darren Potter tries a through ball, but Simon Church is caught offside. Foul by Simon Church (MK Dons). Alou Diarra (Charlton Athletic) wins a free kick in the defensive half. Diego Poyet (MK Dons) wins a free kick in the defensive half. Foul by Chris Solly (Charlton Athletic). Offside, Charlton Athletic. Johnnie Jackson tries a through ball, but Tony Watt is caught offside. Attempt missed. Josh Murphy (MK Dons) right footed shot from outside the box is just a bit too high. Assisted by Jordan Spence with a headed pass. Foul by Tony Watt (Charlton Athletic). Jordan Spence (MK Dons) wins a free kick in the defensive half. Foul by Simon Makienok (Charlton Athletic). Attempt missed. Simon Church (MK Dons) right footed shot from the right side of the box misses to the left. Assisted by Carl Baker with a through ball. Johann Berg Gudmundsson went off injured after Charlton Athletic had used all subs. Attempt missed. Diego Poyet (MK Dons) left footed shot from the centre of the box misses to the right. Assisted by Josh Murphy. Antony Kay (MK Dons) is shown the yellow card. Corner, MK Dons. Conceded by Alou Diarra. Carl Baker (MK Dons) wins a free kick in the defensive half. Delay in match Johann Berg Gudmundsson (Charlton Athletic) because of an injury. Delay in match Carl Baker (MK Dons) because of an injury. Foul by Carl Baker (MK Dons). Johnnie Jackson (Charlton Athletic) wins a free kick in the defensive half. Foul by Lee Hodson (MK Dons). Karlan Ahearne-Grant (Charlton Athletic) wins a free kick on the left wing. Substitution, MK Dons. Simon Church replaces Nicky Maynard. Attempt blocked. Patrick Bauer (Charlton Athletic) header from the centre of the box is blocked. Assisted by Johann Berg Gudmundsson with a cross. Corner, Charlton Athletic. Conceded by Dean Lewington. Offside, Charlton Athletic. Tony Watt tries a through ball, but Simon Makienok is caught offside. Nicky Maynard (MK Dons) is shown the yellow card for a bad foul. Foul by Nicky Maynard (MK Dons). Patrick Bauer (Charlton Athletic) wins a free kick in the defensive half. Substitution, MK Dons. Carl Baker replaces Dean Bowditch because of an injury. Delay in match Dean Bowditch (MK Dons) because of an injury.